We’re suckers for super cool pool accessories to enjoy in your cool, refreshing pool. Here are our top 5 favorites that would make a pool day extra fun! These look so comfortable and fun. 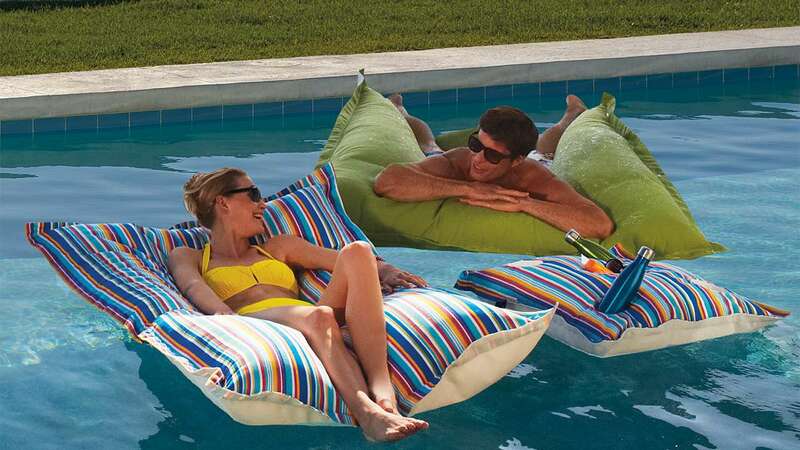 We can imagine floating on one of these cushy pillow Kai floats from Frontgate and never wanting to get our of the pool! Click the image to view / buy. Turn your pool into the envy of all your friends. Movie night, games, special screenings and more. Float up on your Frontgate Kai Floats and enjoy! Click on the image to view / buy. We’ve all been there. Don’t be a casualty at your next pool party – use the SEaLAbox to protect your phone and enjoy worry free water fun. It’s not a pool party without the tunes. Bring yours on the go with wireless bluetooth functionality (after all, everyone likes a turn to play DJ) and water resistant for pool time fun! The festivities don’t have to end at dusk. Take your pool party into the evening with floating pool lanterns in different colors. Do you have some favorite, fun pool accessories that you can’t live without? Share them in the comments below! Where Are the Coolest Pools?